Ir adi – with (your) two divine feet. Next, thirumangai AzhwAr shows us that when it is not possible to do the task using the bow like in destroying of rAvaNan, He would do it using his beauty and kindness. World as represented by four types of areas (forest, mountain, etc.) was spanned by your two steps, and the third step was on the head of mahAbali. For this, you came as a bright and beautiful vAmanan (dwarf) wearing pUNUl and deer skin, and begged for 3 steps of land for a low level wish of Indhiran to get the lands. Can you not come for me who wish for You only? mUvadi … – You who performed what is required by indhran who is after other benefits, can you not do what is required for me who is considering only You as my benefit? nAnilam mUvadi vENdi – World as represented by four types of areas – mullai (forest and related areas), kurinji (mountain and related areas), marudham (town and related areas), neidhal (ocean and related areas) – these are not of much importance (compared to you) – but you spanned them with your two steps; with the aim of capturing him with your third step, you begged for three steps of land. muppuri nUlodu mAn uri ilangu mArvinil – like the brightness of a lightning in dark clouds, your chest is having the pUNUl and deer skin as a bramhachAri. oru mAN Agi – being an unparalleled brahmachAri. 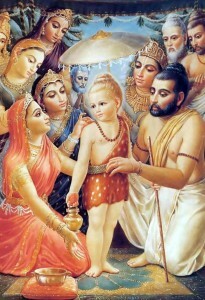 To get the land that indhran begged Him to get back, he begged for the land in the form of a vAmanan (dwarf), like a brahmachAri who has had a long time experience in begging, where the sweet expression in such a person’s face would not be different whether the other party grants the alms or does not grant the alms. He is so beautiful in this form, that there is no parallel, and even if He Himself wants to be born like this, it would not be possible for him – such was vAmanan’s beauty. oru muRai Iradi mUvulagu aLandhanai – at one time itself you measured using two steps, the three worlds. By this, AzhwAr says, “Like how for Indhran you got him back the kingdom of the three worlds, for me please give me what I wish for – being sEshan (subservient) to you”. You took these efforts for those who wished for other benefits, can you not take some efforts for me who only wish You as the benefit? indhran lost some inconsequential land only, whereas I have lost me and You both. (When spanning the worlds) You had touched the heads of everyone including those who were not interested in You; can you not give your thiruvadi (divine feet) to me who wishes for you? Unlike indhran with his lowly interest in land, and unlike mahAbali who was proud of his character of being the best in donating to others, am I not interested only in getting You? I wonder whether you will do the deeds, even by going as a beggar, only to those who wish for things other than You. Would you not do the deeds for those who wish only for You? This is similar to wishes of other AzhwArs and AcharyAs – only interested in emperumAn’s thiruvadi on their head. This entry was posted in iyaRpA, thiruvezhukURRirukkai and tagged 4000, azhvar, azhwar, dhivya, divya, english, introduction, jeeyar, jIyar, kaliyan, kutrirukkai, meanings, naalayira, naalayiram, prabandham, thirumangai, thiruvezhikURRirukkai, thiruvezhu, vyakyanam on June 18, 2015 by raghuram.